If you know little about art, like me, then perhaps you have never heard of Maud Lewis, a woman famous for her folk art paintings until he death in Nova Scotia in 1970. 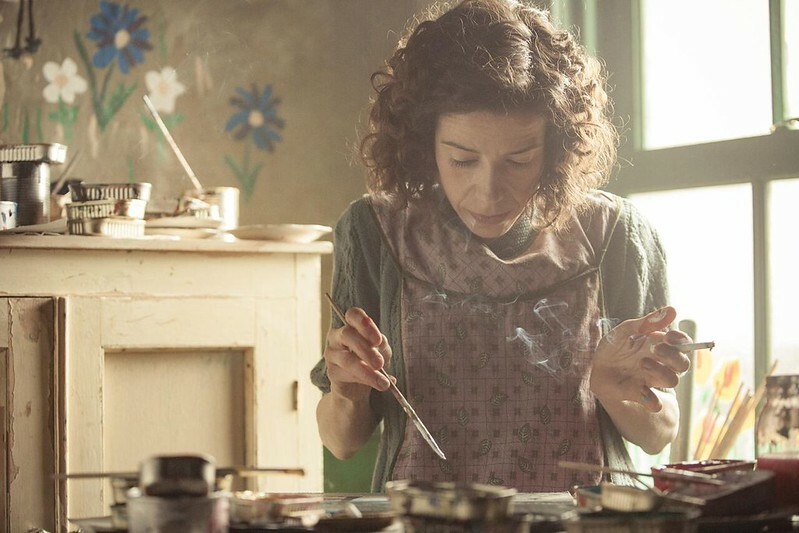 You thus also perhaps did not know that Maudie, starring Sally Hawkins as Maud and Ethan Hawke as her husband, Everett Lewis, was based on their story. It's a story that covers a lot of years, starting from the time Maud left the care of her cold aunt and selfish brother to answer an ad for a live-in housekeeper. She was in her mid-thirties; Everett was forty. He lived in a one-room house outside of town and felt he needed help with housework -- which, eventually, he wound up tending to himself while Maud spent her time painting. These two had their own clear sets of challenges. Maud lived with juvenile rheumatoid arthritis, which caused her to hunch over and have some difficulty both walking and holding paint brushes. But not only did she manage, but one would be loathe to say she "suffered" from this condition -- indeed, Maud is a woman who easily appreciates the simplest pleasures of life. She loves a window. When she explains why to the woman who starts commissioning paintings from her (a lovely Kari Matchett), it's almost eye-opening. It makes sense. Everett, for his part, is almost cripplingly emotionally repressed, if not of below average intelligence. He doesn't quite know how to deal with Maud at first, and is briefly violent. For a woman in the late thirties and forties, Maud proves surprisingly assertive. She finds way to stand her ground. These two never quite seem to know how to talk to each other, but a love grows between them over the years that is very sweet. Maud paints for pleasure, and at first she starts with charming little illustrations on the walls of her and Everett's tiny little house. Eventually her paintings get noticed, and even start making money. Over time, this is a slight complication in a relationship between two simple people who are living an otherwise very simple life together. And it all unfolds with a quiet confidence thanks to director Aisling Walsh and writer Sherry White, who tell us this story in an unassuming yet completely absorbing way. And Sally Hawkins and Ethan Hawke each give stellar performances, which on their own turn Maudie a film that demands attention. We follow them over the course of decades, and yet it never feels rushed -- a rare achievement in film. By the end, after we've seen them spend a life together and then contend with endings, it does turn into a bit of a tear jerker. If you're looking for a good cry, you could do worse than this. Maud and Everett are two very different people who found each other by chance, one's effortless charm slowly eroding the other's obstinately hardened exterior. You'll fall in love with both of them.